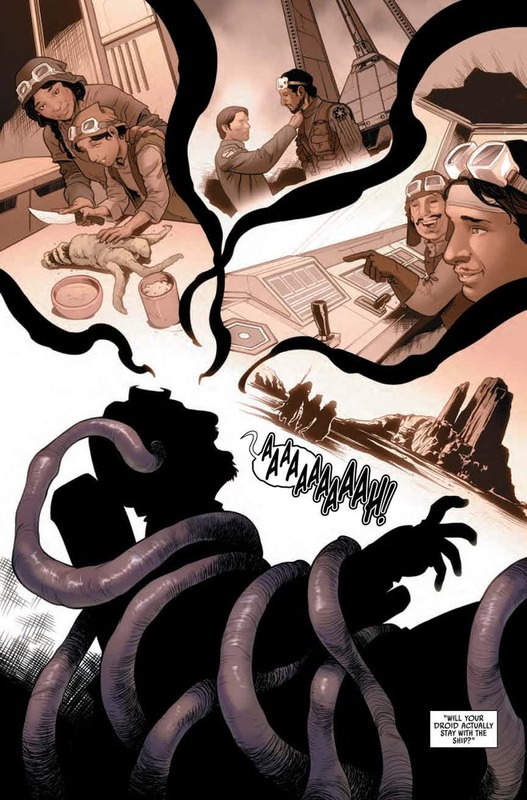 The second issue of Marvel's Rogue One comic doesn't feature much in the way of fresh material, but it's brought to life with some top-notch artwork. It’s tricky to get comic book adaptations of movies right. A lot of the time, the material on the page is too similar to what we’ve already seen on the screen for it to be that worthwhile a read. 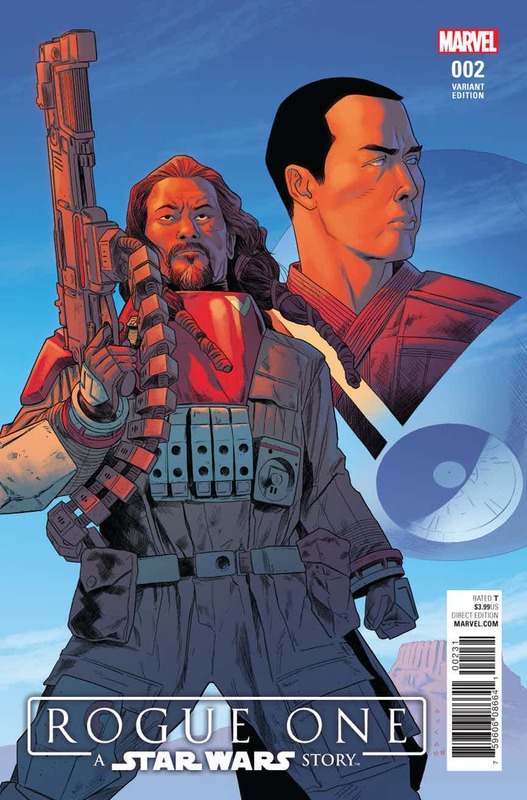 Star Wars: Rogue One Adaptation #1 was a great start to Marvel’s translation of the recent Star Wars Anthology movie, though, as it gave the narrative a fresh twist and filled it with new scenes based off those that were removed from the theatrical cut. Issue #2, on the other hand, isn’t quite as strong, as the bulk of the comic we’ve seen before in the movie. 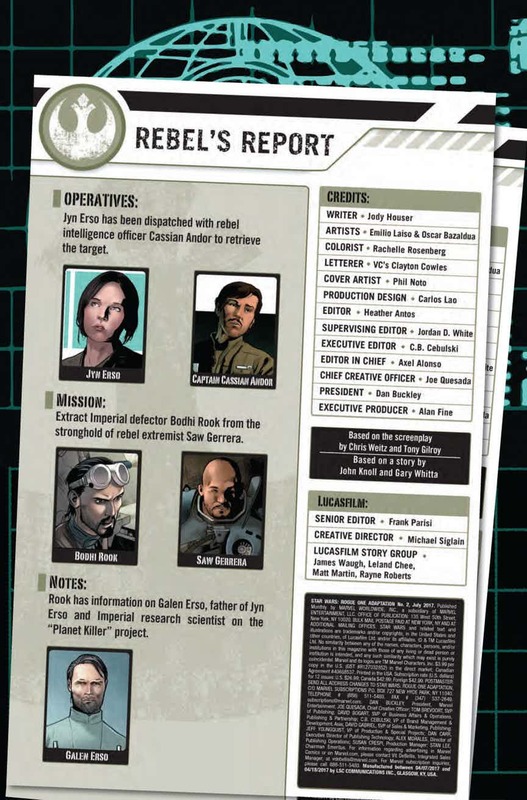 As the first issue tackled the opening 25 minutes of the film, the second handles up until roughly the 45 minute mark of Rogue One. 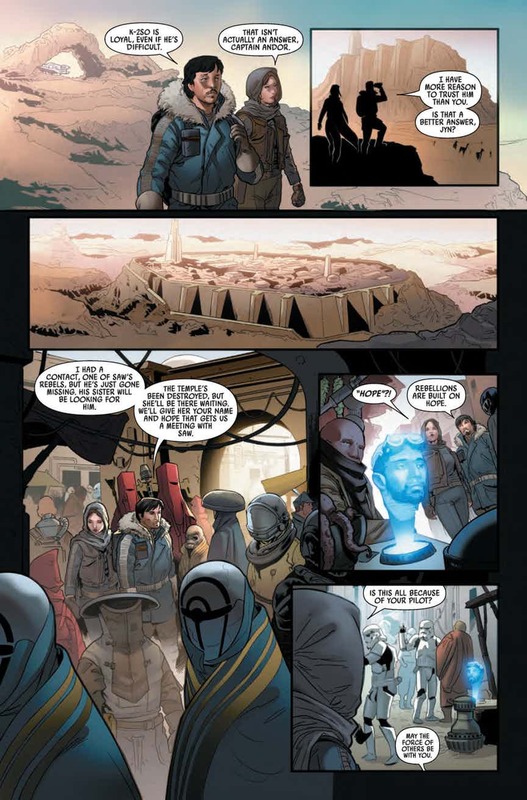 You might recall, then, that this is the segment where Jyn, Cassian, Kaytoo travel to Jedha. 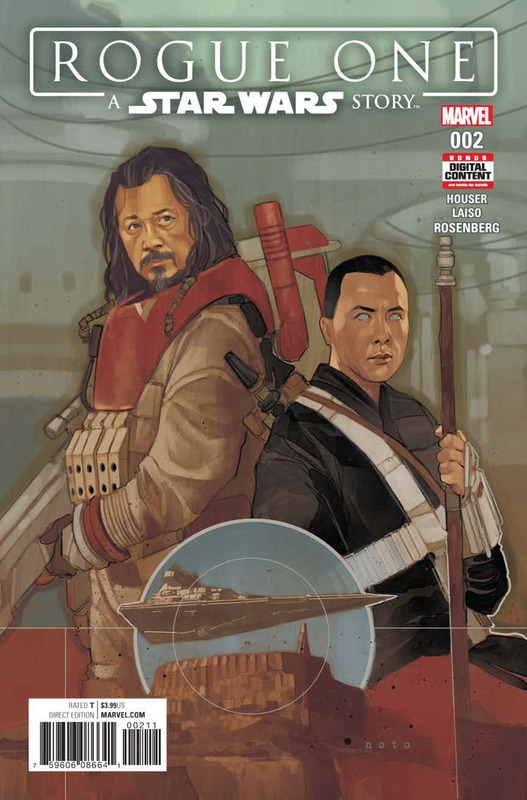 There they encounter Chirrut Inwe and Baze Malbus and are taken to Saw Gerrera. Meanwhile, Grand Moff Tarkin orders Director Krennic to test out the Death Star on the planet. Most of these events play out exactly as they do in the movie, often with word-for-word recreations of the dialogue to boot. There are occasional embellishments, but these are minor moments of creative licence. 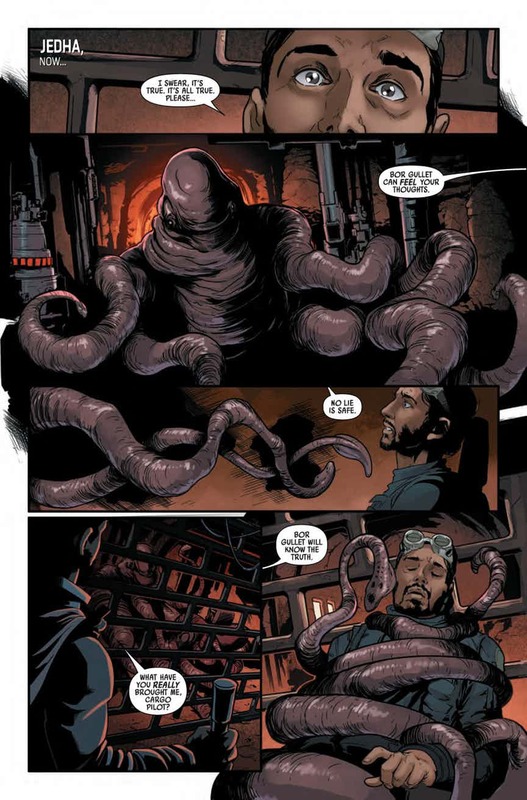 For instance, when Bodhi Rook is interrogated by Saw’s pet Bor Gullet, we see snippets of his memories. Preparing food with his mother as a boy, laughing with a friend, etc. It’s a nice touch, as it helps add some more meat on the bones of a character who wasn’t particularly well served in the movie. Still, these additions don’t add a great deal to the overall piece. Instead, the issue is more likely to cut material out. On a couple of occasions, the comic sharply jumps to the next scene in places where the film took its time. For example, it doesn’t supply an explanation for who begins the attack on the stormtroopers in Jedha City. These sort of excisions aren’t lethal, and in each case it’s only extraneous information that’s being left out, but the cuts still harm the general flow of the story. I suppose something has to go though when you only have a limited page count. While Jody Houser’s script might be overly familiar, at least the artwork from Emilio Laiso and Oscar Bazaldua is top-notch. The pair continue to perfectly capture the likenesses of the actors in the film in each panel, though without turning them into slavish portraits. They also excel at the book’s action. In particular, there are some great page layouts here. For instance, one dialogue-free page is designed with off-kilter, misshapen panels to emphasize the dynamics of the action. 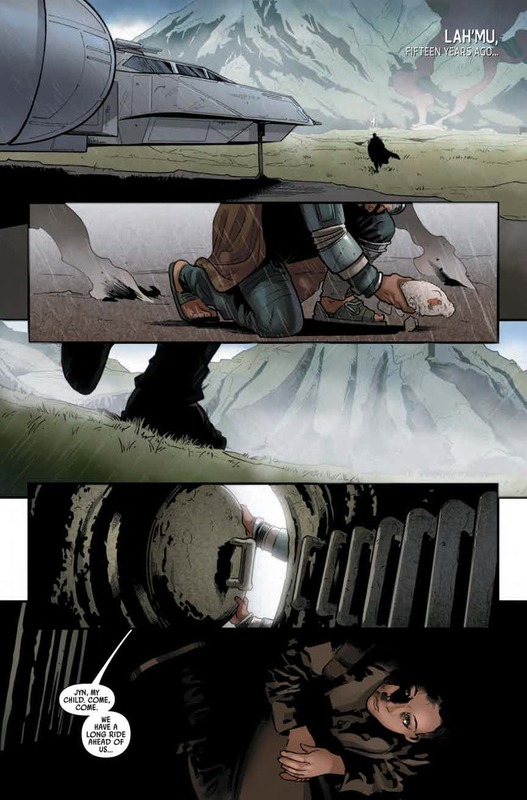 It’s somewhat disappointing that Chirrut’s awesome take-down of a troop of stormtroopers – one of the iconic scenes in the movie – is dealt with in a single panel, however. 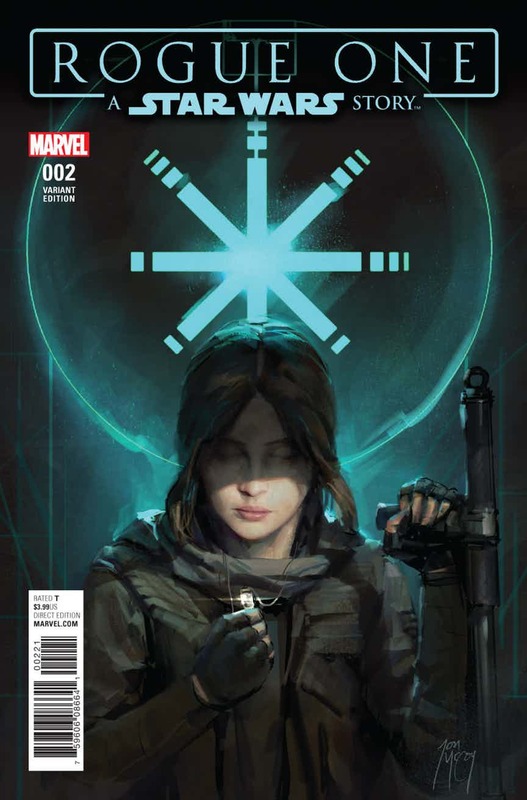 Overall, Star Wars: Rogue One Adaptation #2 will disappoint some as it features far less fresh material in comparison to the first issue. However, that might not be Houser’s fault, as there might just not have been many deleted scenes from this segment of the story. What the issue does have going for it is that it brings the familiar plot to life with some great artwork, though it’ll be up to you to decide if that alone makes this book one that’s worth picking up.